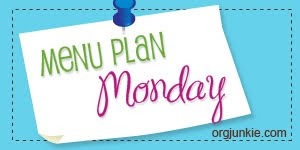 This is a part of the wonderfulness that is Menu Plan Monday over at Organizing Junkie. What a great idea to plan from a different cookbook each week. This is something I might have to try, it seems to me this would prevent boredom with your menu. Your menu plan sounds delicious. Thanks! It all really came about as a way of culling cookbooks since I have more cookbooks than shelves. I like this method of randomly picking out a few recipes as a taster of each book because you're right, it prevents boredom. Thanks for stopping by! I've never eaten venison but one day I will be brave enough to try it. Great menu plan. Thank you for dropping in. Venison is SO yummy and good for you - no hormones, totally organic, and extremely lean. Because it is so lean though, you need to cook it low and slow. Give it a try! I'm with ya sister on the not being able to resist the half pricers...Don't get me started on vintage cookbooks at estate sales...it's like a gravitational pull. Isn't it neat to see what food was in vogue 50, 75, or more years ago? I know what you mean about ingredients. Especially when you live in a small town, it's hard to find slightly odd or obscure items. Good luck with your search for images of the Whole Foods book. It really was quite good.